Chapman Smith Corporation is an Industrial Sales & Service Company dedicated to providing quality products and services at significant savings for our customers. With over 40 years experience in the steel and manufacturing business, we know we can help our customers reduce costs. Our job is to make life simpler for purchasing professionals. We provide a single source option for a wide variety of products and, in the process, reduce the workload in the purchasing and engineering departments. Our services include Cost Reduction Studies, Source Reduction, Source Identification and Qualification, plus Inventory Support and Special Projects. 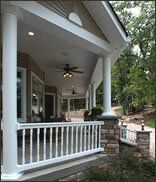 Contact us for more information on our fence rail products plus these other services. Home Set Up An Account Custom Parts Quote Request About Us Contact Us © 2010 FenceReinforcements.com All Rights Reserved.